Kummattikali is the famous mask-dance performed during Onam in Thrissur, Palakkad and Malabar areas of Kerala. The origin of Kummattikali is associated with Lord Shiva and his Bhoota Ganas. The mask-dance begins after offering prayers to Lord Shiva. Shiva appeared as a hunter before Arjuna during the 13-year exile period of Pandavas in the Mahabharata. Shiva and Arjuna hunted down the same boar. Both Arjuna and Kirata shot arrows on the boar. One arrow hit the boar and it fell down dead. Both Arjuna and Kirata made the claim to the kill. A battle of words ensued between them. Soon it turned into a fierce fight. First with bows and arrows, then with sword, missiles etc. All attempts of Arjuna were thwarted by Kirata. Fire missiles were answered with rain missiles. Nagastra was minimized by Garudastra. Finally both took to hand to hand to combat. Arjuna was easily overpowered by Kirata. Soon Arjuna realized that Kirata was no human. Arjuna immediately collected some clay, created a Shivling, and started showering it with forest flowers. The forest flowers flew to Kirata’s head. Arjuna at once fell on the feet of Shiva. Shiva and Parvati appeared before him and blessed him with divine weapons. Shiva Bhoota Ganas who witnessed this divine incident started dancing and singing. This dance later came to be known as Kummattikali. Shiva temples in Palakkad, Thrissur and Malabar region have strong association with the Kiratarjuniya legend – Vettekkorumakan concept is based on this. Another popular legend is that King Bali (Mahabali or Maveli) was ardent devotee of Shiva. 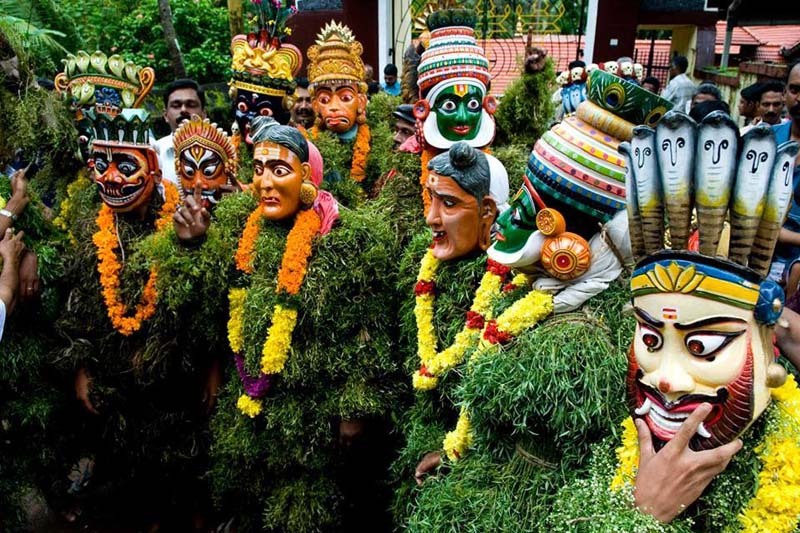 Onam is based on the story of King Bali returning to visit his subjects. Therefore, Shiva Bhutaganas arrive during the period to enquire about the welfare of the people. They also welcome King Bali with the Kummattikali. The highlight of the dance is the wooden mask and the green grass costume worn by the dancers. A long stick is held by the dancers.